When the GUI has started, load the state.bz2 file. If relax is not restarted, all messages will be in a single log file. # Parameter description:  The population for state A. # Parameter description:  The exchange rate. All other spins will be deselected. From the non-clustered results, it could be argued that all spins in the entire system experience the same dynamic process, i.e. they have the same pA and kex values. Such an analysis could be performed at a later stage if desired. The dispersion curves for the residue :60 could also be inspected to see that dispersion is likely to be present and another clustered analysis including this spin performed. The number of clustered analyses performed is up to the user - imagination is the only limit. To start the analysis, open the analysis selection wizard as was performed previously. Name the analysis as `Dispersion - Hansen (clustered :59 to :67)'. Once the analysis is initialised, change the results directory to ∼/tmp/dispersion/clustered. To use the results of the previous analysis to speed up this analysis, as clustering will cause the grid search to be impossibly long, change the “Previous run directory” value to ∼/tmp/dispersion/non_clustered. 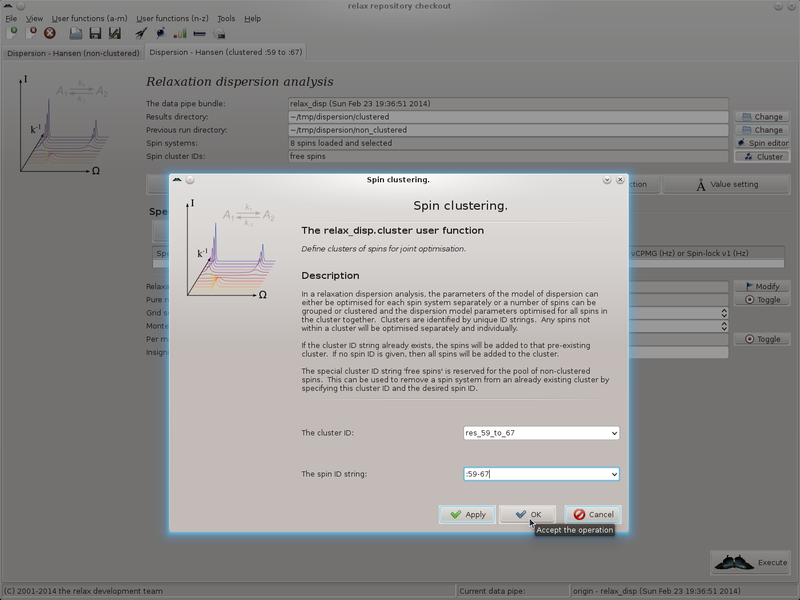 Set up the spin systems as for the non-clustered analysis. This time however deselect all spins except for those of residues :59 to :67 (excluding :60). This can be performed by right clicking on the spins in the spin viewer window. As spin :60 is deselected, that residue will be skipped in the analysis. Then set the spin isotope and load all of the Sparky peak lists as before. Chose the models `R2eff', `No Rex', `CR72', and `NS CPMG 2-site expanded'. As the `CR72' and `NS CPMG 2-site expanded' were seen as being statistically equivalent in the non-clustered analysis, click on the “Toggle” button of the “Pure numerical solutions” GUI element to avoid the `CR72' model in the model selection step. Actually, as the initial parameters for the `NS CPMG 2-site expanded' model in the dispersion auto-analysis will be taken as the average from the non-clustered analysis, the `CR72' model could be completely skipped. The spin cluster [':59', ':60', ':61', ':62', ':63', ':64', ':65', ':66', ':67']. As residue 60 is deselected, it will not be used in the optimisation or any part of the analysis. The full analysis should take a few hours to complete.